Diagnostic imaging is technology used by physicians to look inside the body for clues about a medical condition. A variety of machines and techniques create medical images of the structures and activities inside the body. At Southeast Health we utilize the latest technology of diagnostic and screening services designed to best meet the needs of our patients and physicians. Detailed 3-D images allow our team of board certified radiologists and certified technicians to accurately diagnose disease and other medical conditions. The technology your physician uses depends on your symptoms and the part of the body being examined. Most imaging tests are painless. A Computed Tomography (CT) Scan is one of the most popular scanning exams utilizing multiple x-rays in a cross-sectional imaging technique. It is reliable in spotting abnormalities as opposed to a plain x-ray. 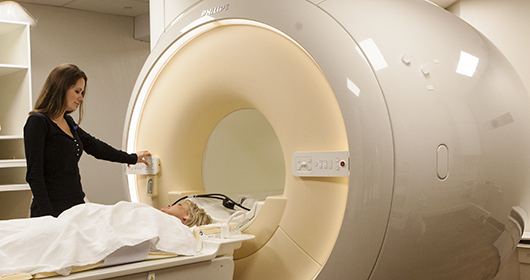 CT scans, which show a 3-D image of the area of the body being examined, are used to support or help establish a diagnosis. CT scans can help detect brain injuries, bleeding within the body, blood clots, strokes, tumors, tissue damage, blood vessel blockages, bone malformations and more. CT scans are also used for preventive medicine to diagnose patients with a high risk or family link to certain kinds of cancer and heart disease. A mammogram is a special type of low-energy X-ray of the breast, commonly used to detect breast cancer. A mammogram allows physicians a closer look for changes in breast tissue that cannot be felt during a breast exam. Mammograms can show tumors before they are large enough to be felt during a breast exam. Southeast Health uses digital mammography, allowing for mammograms to be stored electronically. Technology allows for image manipulation for clarity. Changing the contrast can provide improved visibility. The radiation is less in digital mammograms as opposed to traditional film mammograms. Because they are stored electronically, they are easily revisited and transmitted for further analysis when needed. 3D mammography allows doctors to examine your breast tissue layer by layer. So, instead of viewing all of the complexities of your breast tissue in a flat image, as with conventional 2D mammography, fine details are more visible and no longer hidden by the tissue above or below. Southeast Health is the first hospital in the region to utilize the newest 3 Tesla MRI unit, the highest quality vascular imaging. The increased clarity of a 3T is particularly beneficial for pathological conditions involving the brain, spine and musculoskeletal system. The quality of the scan allows our board-certified radiologists to differentiate between benign and potentially hazardous medical conditions with confidence, providing you with earlier diagnosis and treatment. The 3T is efficient, allowing for shorter scan times and is more comfortable for the patient. A tesla is a unit of magnetic measurement. Southeast Health also utilizes two 1.5 Tesla MRI units. A myelogram is an imaging procedure performed on an outpatient basis by a radiologist to diagnose medical conditions of the spinal canal, spinal cord and nerve roots. The procedure uses a combination of real time x-Ray imaging (fluoroscopy) and CAT Scans (CT). During the examination a contrast material or “x-ray dye” will be introduced into the spinal column with the use of a spinal needle. The images obtained during the myelogram will allow your physician to evaluate and treat your medical condition. X-ray technology uses electromagnetic radiation to make images. The image is recorded on a film or radiograph, and is used to determine the type and extent of a fracture and to detect pathological changes in the lungs, stomach, intestines and other parts of the body. x-rays help physicians diagnose various diseases or ailments. Radiographs can be produced using a variety of imaging methods, and they all require exposing the patient to X-ray radiation. The image or picture is basically a shadow of the parts of the patient that absorb or block the x-rays. The image can be collected on photosensitive film, on a digital imaging plate, or seen live on a fluoroscope – sort of like an x-ray TV camera. Fluoroscopy, useful for catheter guidance, produces real-time images of the body employing a constant input of X-rays at a lower dose. Fluoroscopy is often used in image-guided procedures when constant feedback is required during the procedure. Radiographs are usually taken by a trained registered radiology tech. The resulting images are then interpreted by a radiologist who makes a diagnosis or suggests further tests.